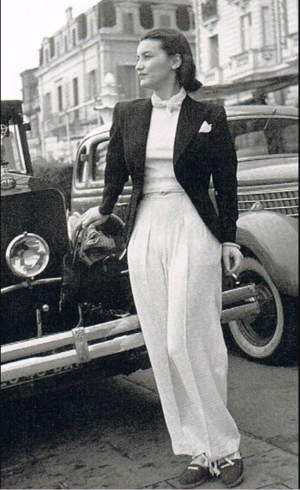 Gabrielle “Coco” Chanel in Cannes 1939 beautiful and confident in trousers. 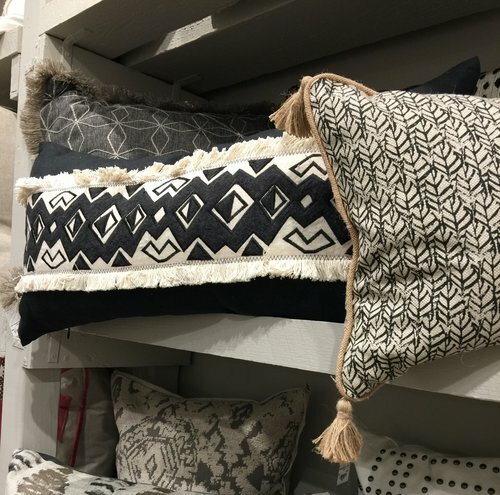 As a trimmings designer and design writer, I’m always looking for what is trending in fashion and home design to inform my work. What fascinates me most in this process is digging to find the origins of the trend. Just as Coco’s drop-waist dress was created in reaction to the cultural zeitgeist, all trends are birthed by something current. 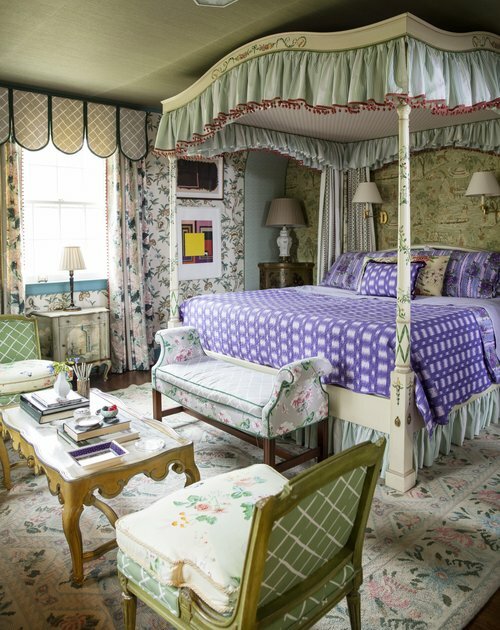 The Maximalism trend afoot is described by Julie Lasky in The Wall Street Journal as, “a layered décor style packed with delightfully disparate elements.” She says, “Maximalist spaces reflect their occupants’ travels, pasts, and quirks,” something Chanel understood a half a century ago; decorating is a form of self-expression. Kelly Wearstler embraces this blow-out esthetic of leaving no surface unembellished. 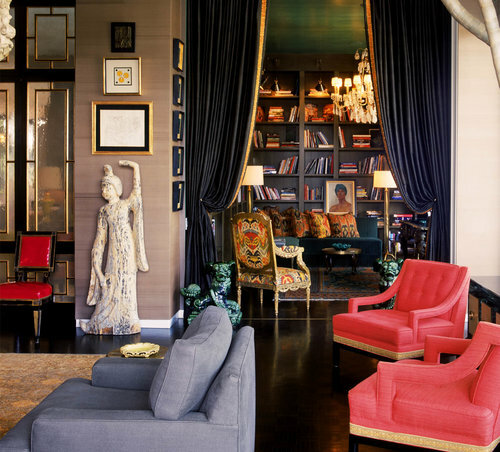 Her dramatic interiors are a rich, ebullient mix weaving vintage and modern seamlessly. It is an interior designer’s job to interpret their clients’ taste, personality, lifestyle and even values, and apply that interpretation to the design of their home. And whether a consumer realizes it or not, the décor of their interior reflects all these characteristics. Playing with materials for a trimmings collection. My job when designing a trimmings collection is similar; I take a theme — say Belle Epoque, for example — and interpret its essence into narrow textiles, a woven cord, a gimp, fringes, a jacquard and/or an embroidered tape. These eventually become the tools that people use to layer into their pillows, upholstery, and window treatments to convey their personal story. 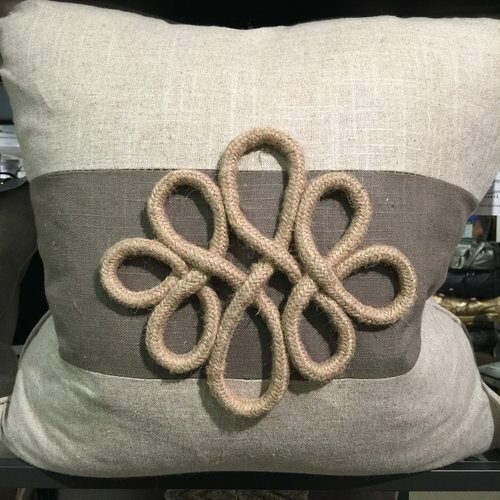 The easiest way to add your soul to your décor is by adding embellished statement pillow, whether they are purchased, custom-made, or DIY, to your living room and bedrooms. I call this DIY process of embellishing with trimmings, Trim Alchemy — the transformation of the ordinary into the extraordinary using trims. What is it that you want your décor to say about you? 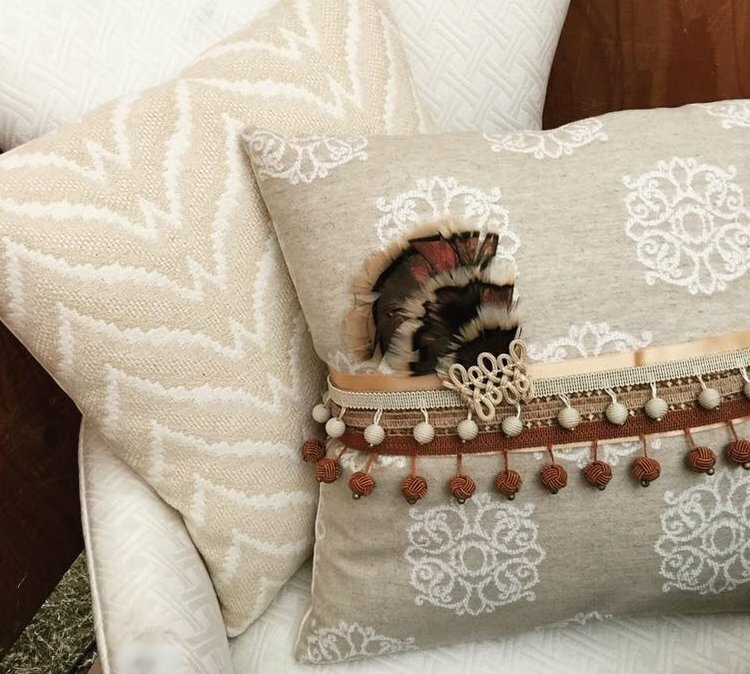 A Trim Alchemy embellished pillow made by a women I met, Serena, at the Country Living Fair at my Alchemy of Trimmings LIVE show in Atlanta. She is a super-creative, elegant person and this pillow she made reflects it. She embellished these Calico Corners pillows with trimmings. Color Library trimmings by Robert Allen accent woven, patterned fabric for a sophisticated mix of textures and patternplay. 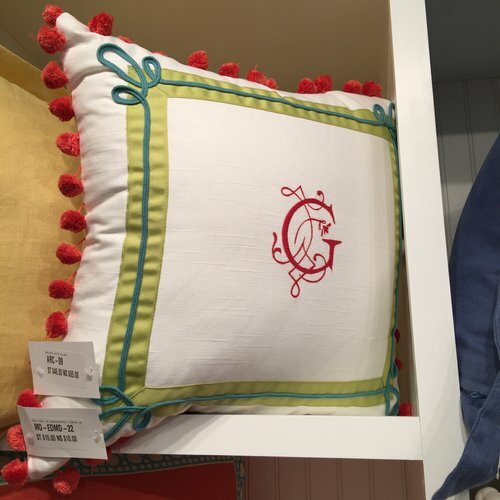 Eastern Accents’ original monogram trimmed pillow with soutache and pompoms for the prep set. Are you a bohemian jet-setter who loves traveling to exotic locales? If that’s you, add jute fringe and ethnic banding to your pillow. If you’re a connoisseur of the arts and a history buff, then add a Greek Key or a Fret Tape as the pillow’s gusset. Do you appreciate all things handmade? 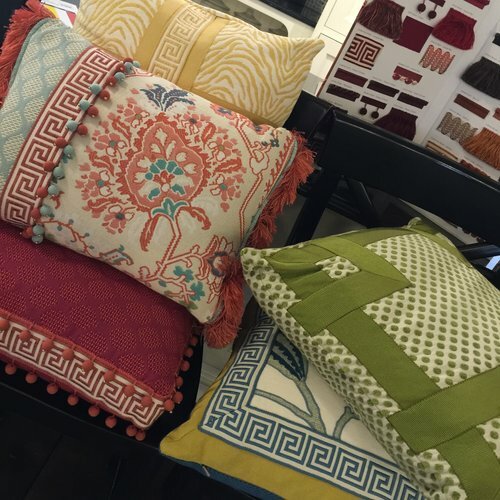 Add an over-scaled passementerie to your sofa pillow, or a Czech glass button perhaps. 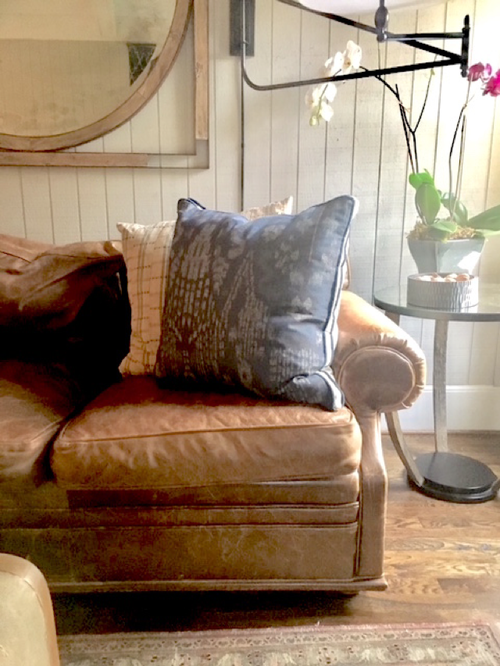 Pillows, grouped together, can begin to express the complex story of who you are. Have you heard of the statement necklace? Well, pillows speak volumes too. Natural fringe and jute tassels give a bohemian feel at Lacefield Designs. See Beth’s style tips below. An elegant passementerie mixed with a color blocked linen pillow vibes casual elegance at Stuart Lawrence. 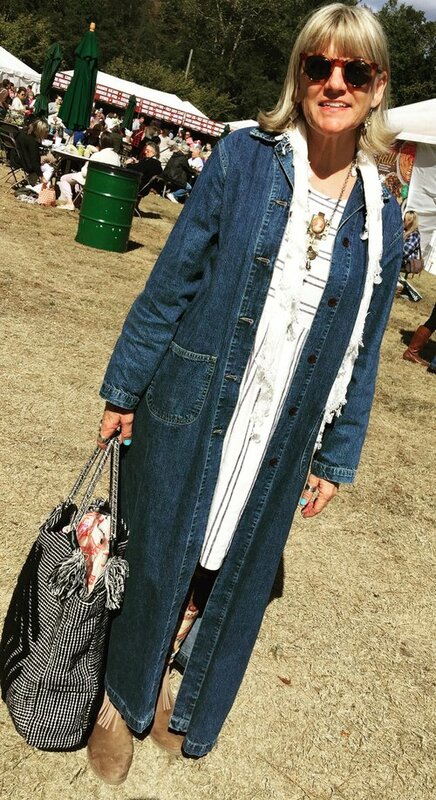 Mary Jane McCarty is a vintage textile expert and couture pillow & lampshade designer. 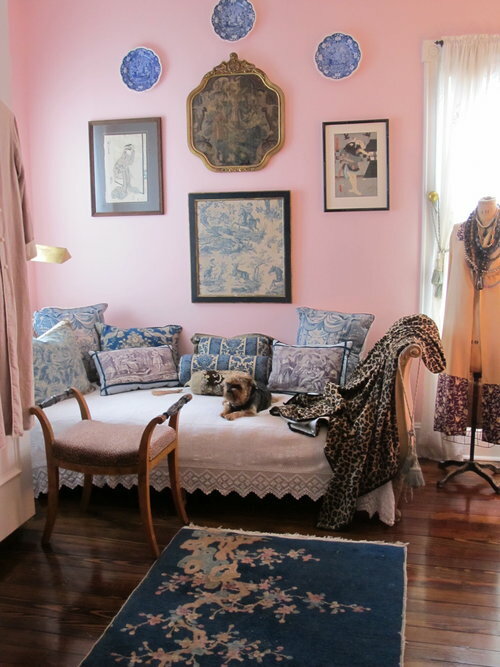 Her Fortuny cushions caught my eye on Instagram (MUST FOLLOW) and I was curious about her personal interior. She gifted me with the voyeuristic photo below of her dressing room. What does it say about her? She has a connoisseur’s taste with a whimsical side! We are Instagram pals but in the not too distant future, our passions will have our paths crossing in real life. 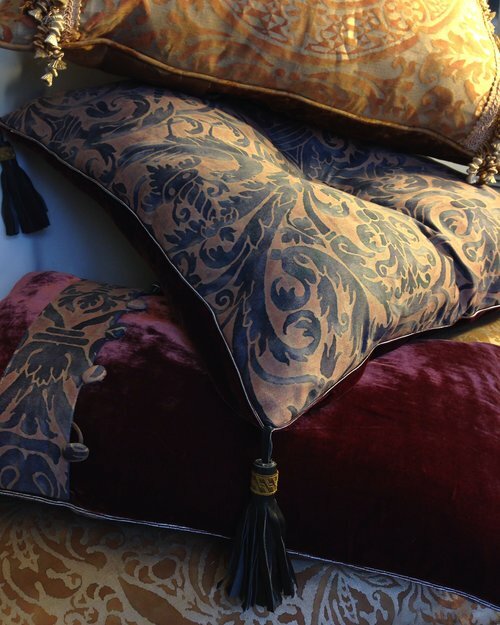 Mary Jane McCarty uses vintage Fortuny fabrics and antique trimmings to create exquisite pillows collection that sell at Bergdorf Goodman and Barneys. Mary Jane McCarty says “I like to layer many different patterns but keep a fairly tight color theme. And a splash of leopard never hurts!” Gigi, her Brussels Griffon, enjoys her mamma’s good taste and whimsical nature. Beth Lacefield’s personal sofa reveals her personality. Beth Lacefiled, of Lacefield Designs, is a designer that follows her curiosity. 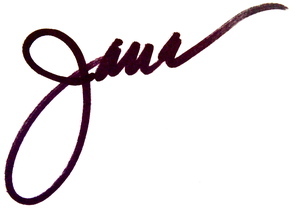 Her varied interests may take her traveling for inspiration or to study new subjects or fabrication techniques. She’s an award winning designer also gregarious and approachable, and her sofa reflects this! Yes Mme. 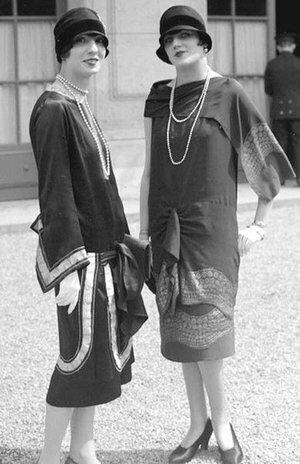 Chanel, my interior is a projection of my soul; a lover of artisans, part fashionista, and a designer not mired in tradition, but rather inspired by it. Look around. What does your interior say about you? I’d love to hear in the comments below. Until next time, keep #trimspotting so I can share your creativity! Velvet fabric on sofa by JB Martin, pillow fabrics and trims by Robert Allen Design, embroidered pillow by Jenny Krauss fringed stilettos mine.